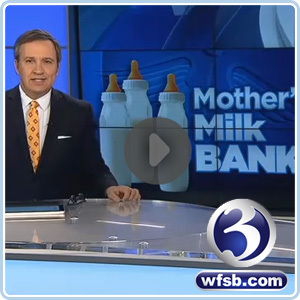 GUILFORD, CT (WFSB) – A first of its kind breast milk depot is providing much-needed sustenance to infants in need. “At first I really didn’t know what the milk went to but then I found out it went to all the NICU babies and I was more than happy to donate as much breast milk as I could,” said Amy Farotti, a breast milk donor. Farotti said she had her baby Charlotte10 months ago. The married 30-year-old mother of two from North Branford said she’s a nursing mom who produces more milk than her baby needs. She said she felt compelled to not let the extra go to waste. Farotti said she became the first donor to the first Human Milk Depot in Connecticut. It’s located inside Acelleron Medical Products on the Boston Post Road in Guilford. The company already provides breast pumps and other support to nursing mothers. Now, it will be a donation center that will collect and freeze the milk before it’s sent out to participating Connecticut hospitals. One of the biggest questions asked is about safety. However, organizers assure that this milk is tested more rigorously than blood is for blood donations. The Food and Drug Administration does not regulate human breast milk, but Mother’s Milk Bank Northeast, which will be processing the milk, adheres to strict guidelines including blood testing all donors before any donation can be made. Yale Neonatal Intensive Care Unit nurse Jacqueline Ferraro said she has seen first hand the before and after of how breast milk can make all the difference in the world for a sick preemie. Eyewitness News asked the state Department of Public Health to weigh in on the safety of milk depots. Spokesperson Marilyn Lonczak emphatically agreed that they’re valuable and lifesaving. “I understand the safety concerns, because these are medically fragile infants receiving this, but actually human milk banking has had a long established safety record in North America since the early 1940s,” Lonczak said. The depot is supplying milk to Yale-New Haven Hospital, St. Francis Hospital, Children’s Hospital of Connecticut and a list of others. However, it is looking to expand to more hospitals and ultimately have more locations in other parts of the state. For further information about donating or receiving milk, contact Mother’s Milk Bank Northeast at 617-527-6263 or log on to www.milkbankne.org.